Liverpool have demonstrated quality, resilience, commitment and endurance since August. It has put them top of the table with just six games to play. 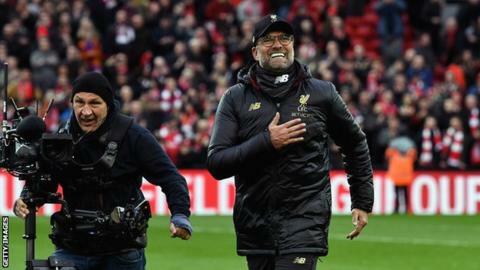 Sometimes, however, other forces are required and as Liverpool fans filed out into the streets around Anfield in a state of elation and disbelief, this 2-1 win over Tottenham prompted another question - are Klopp's men now being guided towards their first title in 29 years by destiny? Liverpool have not been quite the scintillating attacking force of last season but it is a combination of this forward-thinking power and other qualities previously mentioned that have put them in sight of their first title since 1990. They were all on show as Liverpool rode their luck and dug into their reserves to win a game against Spurs that looked set to be a draw - and could even have been lost had Moussa Sissoko's nerve not failed him so spectacularly as he raced clear on goal in the closing minutes with the score 1-1. It left the last page of the dramatic storyline to be written as Spurs keeper Hugo Lloris, too often prone to error, fumbled Salah's header on to Toby Alderweireld's shin and into the net in front an exultant Kop. Liverpool did not deserve the three points but they will take them and will not care one jot. And who can blame them? Klopp's side were nowhere near their best but it is one of the oldest truisms in football that champions are often those who win in these very circumstances. As Liverpool supporters celebrated another significant result in the chase for the trophy that has been out of reach for so long - and may still remain so given Manchester City's relentless progress - there is just that growing sense that this season those strange events that can decide things such as Premier League titles may be falling for them. Remember Riyad Mahrez's late penalty miss that could have given Manchester City two more points in the goalless draw here at Anfield in October? Remember Everton goalkeeper Jordan Pickford's inexplicable error that gave Liverpool victory via Divock Origi's 96th-minute winner in the Merseyside derby at Anfield in December? Remember how Crystal Palace's veteran keeper Julian Speroni was so badly at fault in the 4-3 win over Crystal Palace at Anfield in January? Lloris can now add his name to that list, as can Sissoko, to add weight to the argument of those who believe there is a touch of destiny about Liverpool's Premier League pursuit season. And they all add up alongside Liverpool's other outstanding performances to make the sort of package that can win a Premier League. Klopp, asked about the twists of fate, said: "I don't go that far but you go through the season of other teams, you will find these things as well. For all the points we have now, we work really hard. "It is not important when you score but what it is on the scoresheet afterwards. Momentum is not a coincidence. It is something you take, you keep and you use." Manchester City can put themselves back at the head of the pack with victory over Cardiff in midweek but it has been evident from day one of this season that Liverpool are not going away and the manner in which they dug themselves out of a hole here is a huge tribute to their attitude. Liverpool showed the ingrained resilience in their last league game at Fulham when they were pegged back after dominating but won through James Milner's late penalty. And no-one sums up that attitude better than left-back Andy Robertson. Andy Robertson has nine assists for Liverpool in the Premier League this season. The only other defenders to have had more in a single campaign are Andy Hinchliffe (1994-95) and Leighton Baines (2010-11) (both 11). At a time when Scotland's international reputation is at a low ebb after a heavy defeat in Kazakhstan and a scrambled win in San Marino, the small consolation is that they possess a player who is a real jewel in Liverpool's crown. He was outstanding against Spurs, so good there was even a debate among experienced Liverpool watchers as to whether the modest 25-year-old is now on course to make himself one of the club's finest left-backs. Robertson's surging runs gave Kieran Trippier a nightmare first 45 minutes, which included a cross for Firmino's headed goal that was simply perfection, needing only a polite nod to beat Lloris, who was again culpable for a lazy clearance that gave Liverpool possession. Robertson also provided a major contribution as Spurs applied pressure in the second half with a crucial block on Christian Eriksen when the Dane looked certain to score in front of the Anfield Road end. Robertson is the epitome of Liverpool's relentless optimism and self-belief, alongside the class and calm of Virgil van Dijk and those three celebrated forwards. And yet, as the dust settled on another spectacular, chaotic Anfield finale, much of the talk was of fate and that maybe this is the season Liverpool are finally meant to win the Premier League.